Jennifer struggles to find hope for a new life and a home for herself and her two children after her release from prison. Carl learns to communicate and experience love after his life in a gang. Theo learns to feel joy and connect with other former gang members. Christina discovers a peace that allows her to stay sober and be present with her daughter. 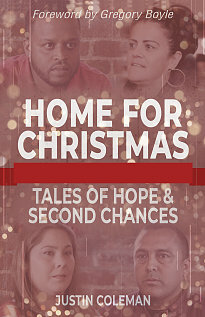 The four-week “Home for Christmas” resource includes a book, a DVD and leader guides for youth and adults. Coleman, who is the senior pastor of University United Methodist Church in Chapel Hill, North Carolina, drew inspiration from the Rev. Gregory Boyle, the Jesuit priest who founded Homeboy Industries in Los Angeles. Coleman is a graduate of Southern Methodist University and Duke Divinity School. Before taking his current position, he served as the chief ministry officer for the United Methodist Publishing House in Nashville, Tennessee, and as lead pastor of the Gethsemane Campus of St. Luke’s United Methodist Church in Houston, where he helped create Houston reVision, a ministry for under-resourced and gang-affected youth in that city. He spoke with Faith & Leadership about his experience learning from Homeboy Industries and what he hopes people will get out of the Advent study. The following is an edited transcript. Q: Why did you write an Advent study based on gang members in Los Angeles and their stories? At our church, we really focus a lot on the themes of hope, love, joy and peace; those are our themes on the four Sundays of Advent. I kept thinking about hope and how much Homeboy Industries really is a source of hope. I thought, “Here are a bunch of folks who don’t have great Christmases.” They’ve actually had pretty awful Christmas experiences, many of them, given their families of origin and the fracturedness and the great brokenness. But if I were to think about hope, love, joy and peace and say what place, what space, what environment most represents each of those to me, Homeboy Industries immediately comes to mind. How is it that people who have experienced so much fracturedness, particularly around that time of year, express those themes of hope, love, joy and peace in ways that are more vivid than I usually encounter? I was in conversation with Abingdon Press, and they said, “Hey, would you do an Advent resource with us and just pitch a few ideas?” So I thought this would be a perfect Advent resource, because it’s making the power of the incarnate gospel come to life. I pitched the idea, and they loved it. The connection with Homeboy arose when I was a pastor in Houston. In southwest Houston, we found ourselves in the midst of a very highly immigrant, multicultural, multinational community, where economics were a real strain. There were a number of working poor in our community as well, and quite a bit of neglect from other parts of Houston. So what you get when you have a community that has been under-resourced and in some ways neglected -- it’s just a breeding ground for something like gang life. What we found was a group of largely teenagers, kids between 13 and 17, who had found their way into juvenile gang activity. We were looking for someone who knew how to do gang intervention in a religious space, and we couldn’t find anybody until we happened upon Homeboy Industries. With a small group who was discerning with me what we might do to impact our neighborhood, we read Father Boyle’s first book, “Tattoos on the Heart.” And we read another book, by Celeste Fremon, named “G-Dog and the Homeboys,” about the early history of Homeboy. So we would go to Homeboy Industries almost quarterly to learn and glean from Father Greg Boyle and the other staff there. It’s from that experience that Homeboy’s ministry of mission has become very close to my heart. Q: Do you think it’s a particularly powerful theme for the Homeboy stories, or is it resonant for everyone during the Advent season? I think for everyone. One of the things I experienced as a pastor is that across the spectrum, people are wondering and having questions about their self-worth. Do I matter? Am I making a difference? What kind of legacy will I leave here on this planet? Does anyone love me? Would anyone miss me? All these different kinds of questions people are asking. Even people I encounter who I feel like have it together, who seem to be doing well. They seem to have wonderful families. They’re upwardly mobile. They’re living a version of the American dream. And then to look them in the eye and say very pastorally that Jesus came into this world and that Jesus suffered, died, rose again -- all of this is because you’re worth it. God so loved the world that God sent God’s only Son because you’re worth it. All of this restorative action of God in the world is because God believed that God’s creation is worth it. It’s worth the sacrifice, worth the love, worth the work. I think that resonates with everybody, honestly -- the sense that we are worth it. Because there are days, I think, when many of us at our weakest moment doubt it. Q: What is your intended audience for this? Is it a resource for former gang members, or are you bringing their stories to less-stressed congregations? Hopefully, their stories will bring us closer to the story of Christ in the midst of this Advent season. The idea is to bring their stories primarily to less-stressed congregations in order to help them gain a sense of empathy for those who are stressed. I hope that in the midst of these challenging stories, people will come close to their own pain, their own struggle, and the pain and struggle of those in their local communities. [I hope] it will stretch our imaginations and say this whole idea of the advent of Christ is Christ coming into a world in the midst of our brokenness, in the midst of our darkness and pain, and transforming us and restoring us. I hope the folks at Homeboy Industries will grab copies and the homeboys and homegirls who participated in this project and are around people who participated in this project will give it to their friends. I would love it if that happens, but I think primarily we imagine congregations buying these and people reading them either as individuals or in small group studies. We’ve got resources for youth groups as well as adult groups. Q: The resource is structured on the themes of hope, love, joy and peace. What’s the journey that you want to take people on through these stories? It’s a mix of Bible study and narrative theology that begins to emerge through story. The core of each chapter is focused on the particular theme, so we hear stories from homeboys and homegirls, hear stories from my experiences as a clergyperson, and then interwoven through those narratives are scriptures that are common to these Sundays in Advent. Q: There are a number of short stories of people’s experiences as gang members, as addicts, being in prison. How did you gather those? We went to Homeboy and had some great conversations with many of the amazing people that you find there. In the video resource, we capture some homeboys and homegirls just telling their stories, and in the book as well. Years ago, when I read “Tattoos on the Heart,” I was very moved by Father Boyle talking about how he had gone with his [siblings] and found this recording of his mother singing “O Holy Night.” She was long past her singing days, and so this was a treasure for them. He mentions this part of the hymn, “and the soul felt its worth,” and that has always stuck with me. That’s what it is about. I thought, “As I preach through this at our church, I really want to incorporate bits and pieces of this hymn.” Because as I looked at the hymn more closely, I found that there is hope, love, joy and peace in it. All of these themes are captured in ways right here in this hymn, and so I had fun unpacking the different parts of the hymn throughout the book and throughout the sermon series. Q: In what way would you hope Christmas might be different because folks meditated on these stories and these scriptures? I hope that within each of these Advent themes, they will treat them as four separate pools, or four separate wells, and they’ll dive in. The hope is that they’ll come in touch with how those themes really work in their Christian lives, not just during Advent or Christmas. I hope they’ll emerge from it knowing how deeply loved and cared for they are by God, and I hope they’ll have been able to articulate ways in which the Christian community has deeply loved them as well. I hope that at the end of all of this, they will feel like they’re worth it -- and that that will carry them well beyond the Christmas season. Q: Is there anything we haven’t covered? A portion of the proceeds from the sale of “Home for Christmas” products goes directly to Homeboy Industries. I encourage people to consider making a gift to Homeboy Industries or Houston reVision. I think those are wonderful ministries that are making a difference in people’s lives every single day of the year, and it’s saving work.